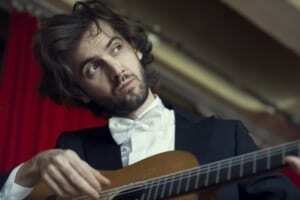 Petrit Çeku (born 2 June 1985) is a Kosovo-Albanian classical guitarist. Petrit Çeku, was inspired to play guitar from his father at the age of 6. He attended the Lorenc Antoni music school from age 9 to 17, where he took lessons from classical guitar by Luan Sapunxhiu. In 2002 he was invited by Xhevdet Sahatxhija to study in Zagreb, Croatia at the Pavao Markovac school of music. In 2008, he graduated from the Zagreb Academy of Music, in the renowned class of Darko Petrinjak. From 2009 to 2013 he went on to study with the great master, Manuel Barrueco, at the Peabody Conservatory in Baltimore, USA, where he completed his studies in 2013. Hailed by guitar critic Colin Cooper as “a soloist of the highest ability”, he is the first prize winner of many international guitar competitions, including the most prestigious ones like Parkening International Guitar Competition (Malibu, USA, 2012), Schadt String Competition (Allentown, USA, 2011), Maurizio Biasini International Guitar Competition (Bologna, Italy, 2011), and Pittaluga International Classical Guitar Competition (Alessandria, Italy, 2007). Petrit Çeku’s exquisite sensibility and expressiveness have attracted and engaged audiences worldwide. He has performed many recitals throughout Europe and the Americas and was a soloist with orchestras such as Baltimore Symphony, Czech Chamber Philharmonic, State Hermitage Orchestra of St. Petersburg and Zagreb Philharmonic. He also appears regularly with the famed I Solisti di Zagreb and is a founding member of Guitar Trio Elogio, established in 2008. Petrit Çeku regularly performs at music festivals such as Next Generation Festival, Samobor Festival, Panama Guitar Festival, Moscow Guitar Virtuosi and Pristina’s Remusica Festival. He also teaches regularly at the Polish Guitar Academy and the Young Masters Samobor Festival. Petrit Çeku’s first CD was released in 2008 by Naxos. Recently he recorded J.S. Bach‘s complete Cello Suites (BWV 1007-1012), arranged by Valter Dešpalj, released lin 2016 under the Spanish label Eudora He plays on a guitar made by Ross Gutmeier.